To the Fundamentalist, sound doctrine must include such things as the inerrancy of scripture, a literal six day creation, and so on. A Liberal Christian might argue that sound doctrine is whatever conforms to the law of love. A Calvinist would build a five-point definition around God’s sovereign predeterminism. So what then constitutes sound doctrine? In First Timothy Paul warned about false teachers of the law and contrasted their legalistic injunctions with, ‘sound doctrine that conforms to the glorious gospel of the blessed God, which he entrusted to me’ (1 Timothy 1:10-11). This statement comes at the end of a passage condemning teachers who promote ‘false doctrine’. We can therefore get some idea of what sound doctrine is by comparing it to what it isn’t. Paul criticises false teachers for devoting themselves to myths and meaningless talk and in verse 7 he describes them as wanting to be ‘teachers of the law’. So, sound doctrine is neither man-made myths nor religious Law, but is something else entirely. In his statement in verse 11 Paul gives us a rough definition of what he meant by the term ‘sound doctrine’; it is that which conforms to the glorious gospel that God entrusted to him. So, in order to determine further what constitutes sound doctrine, we need to explore what Paul understood by this ‘glorious gospel of the blessed God’. In Romans 1:1-4 Paul writes that he has been ‘set apart for the gospel of God…the Gospel regarding his Son… Jesus Christ our Lord’, and in verse 9 he writes about ‘preaching the gospel of his Son’. So the glorious gospel is centred on Jesus. In Colossians 1:21-23 Paul makes it even more explicit by writing; ‘Once you were alienated from God and were enemies in your minds because of your evil behaviour. But now he has reconciled you by Christ’s physical body through death to present you holy in his sight, without blemish and free from accusation — if you continue in your faith, established and firm, not moved from the hope held out in the gospel. This is the gospel that you heard and that has been proclaimed to every creature under heaven, and of which I, Paul, have become a servant’. So, sound doctrine is that which has its basis in Christ Jesus – in His reconciling act of redemption and in obedience to what He taught. In the 5th verse of Romans Chapter 1 Paul writes of his commission ‘to call people from among all the Gentiles to the obedience that comes from faith’. So, sound doctrine includes a call to obedience to Jesus Christ. It is neither myth nor law, but rather the good news of salvation in Christ Jesus and obedience to His instruction. It strikes me that much of what various groups promote as sound doctrine is more like the false doctrine Paul had in mind. Teaching the dogma of a particular theological persuasion does not in itself constitute sound doctrine. Calling the loyal to obedience to a church hierarchy or to a system of legalistic behavioural patterns does not constitute sound doctrine. I think that we are living in times where many people no longer teach or receive sound doctrine. It is all too easy to see this in non-Christian religions, cult systems and so on. However, the lack of sound doctrine in the church itself is a bigger, if less obvious, problem. Sections of the church teach easy-believerism masquerading as Grace, others teach name-it-and-claim-it prosperity, and yet others teach complex theological systems and philosophies. Some sections of the church major on moralistic modes of behaviour while others teach that anything goes so long as it is ‘loving’. I think Paul had this sort of thing in mind when he wrote; ‘For the time will come when men will not put up with sound doctrine. Instead, to suit their own desires, they will gather around them a great number of teachers to say what their itching ears want to hear (2 Timothy 4:3-4). 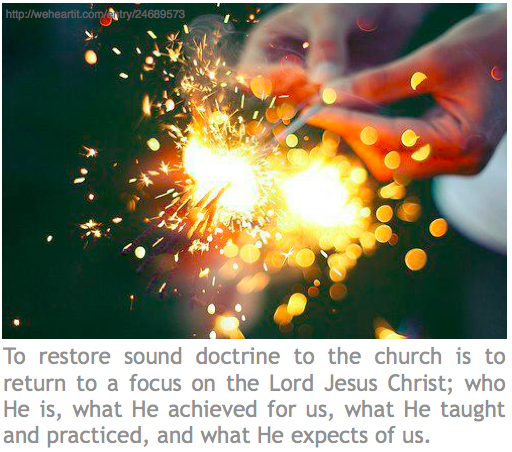 To restore sound doctrine to the church is to return to a focus on the Lord Jesus Christ; who He is, what He achieved for us, what He taught and practiced, and what He expects of us.